The greatest advantage of off-spin bowling is that it can be bowled more accurately than any other type of spin. An off-spinner can be more accurate than a mean and miserly medium-pacer, provided he does not try to impart too much spin or variation. The main leverage to obtain off-spin comes from the index finger of the bowling (right) hand, which while releasing the ball, is turned outwards and downwards by a coordinating turn of the fingers and wrist. The ball is spun from left to right - from the right-handed batsman's off-stump to his leg-stump. Body movement and shoulder swing also play a big part in off-spin. Some bowlers can spin the ball more than others. A bowler who turns the ball a lot should bowl round the wicket. Off-breaks are less exacting to bowl in physical terms, and hence the longevity of bowlers of this type in top-level cricket is on the higher side. An off-break can be delivered with the hand very high and the arm coming straight over. Variation can be procured by delivering from a slightly more round-arm position, so that the angle of spin, when the ball hits the ground, won't be quite the same. On a hard wicket, the off-spinner should bowl on the off stump or just outside the off stump. A consistent off-stump line will trouble the batsman, who will have to guard against several ways of getting out. An off-spinner should always deploy a first slip on a hard surface. Jim Laker, Erapalli Prasanna and S. Venkataraghvan were excellent off-spinners. Of the current lot, Harbhajan Singh and Muttiah Muralitharan are impressive. The spinning agent in this brand of 'deception' is the third finger of the bowling hand. The first two fingers and thumb are used to grip the ball. When a leg-break is about to be delivered, the palm of the bowling hand should be practically facing the batsman and as the ball is released, the third finger should be flicked up and over the ball, thus spinning it somewhere in the direction of gully. More spin can be imparted by the use of the third finger along with a strong and flexible wrist. This requires a lot of practice as spin can be difficult to control. Some bowlers have developed what may be termed as a purely 'finger-spun leg-break'. This form of spin is achieved by reducing the distance between the second and third fingers in the grip, and by rolling rather than flicking the wrist at the point of delivery. While bowling a top-spinner, the palm of the hand should face the ground at the delivery-point. The fingers should point towards mid-on and run practically horizontal to the ground as the ball is flicked out of the bowling hand. As for the googly, it is merely a question of turning the wrist over until the back of the hand is facing the batsman at the point of delivery. From this position, the ball is spun in exactly the same manner as a leg-break, but it comes up from the third finger, over the top of the little finger, and is thus found to be turning in the air in the same direction as the off break. Subhash Gupte was the best leg-spinner of my time. In the present era, Shane Warne is easily the best. The slow left-handed spinner is an extremely accurate type and often fills the role of a stock bowler when batting conditions are easy. His normal task is to bowl to a strong off-side field and to play on the batsman's patience. If the pitch is taking turn, he will be better suited bowling round the wicket. 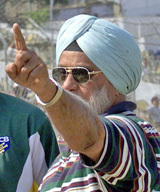 Vinoo Mankad and Bishan Bedi were two of the greatest left-arm spinners of all time. 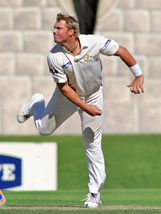 There are some left-arm spinners who bowl wrist-spin as opposed to the conventional finger-spin. The Australians Michael Bevan and Brad Hogg are two practitioners of this type. This brand of left-arm spin is called 'chinaman'. In England, the left-arm spinner's stock delivery that spins from the right-hander's off-stump to the leg-stump is called a 'chinaman'. However, in Australia, the same term refers to a delivery that turns the opposite way; the left-arm wrist spinner's 'googly' that spins from the right-handed batsman's leg-stump to off-stump. The rest of the cricketing world uses the term interchangeably.